Last Thursday night I had the pleasure of attending an event presented by the Bellevue College Arabic Culture Student Association. 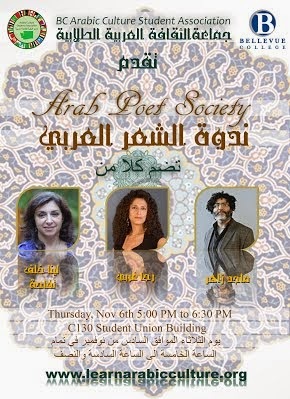 For one beautiful evening this relatively new organization managed to showcase three very diverse Arab voices. Lena Khalaf Tuffaha has lived the experiences of first-generation American, immigrant, and expatriate. In the summer of 2014, her poem “Running Orders”—written from the voice of a Palestinian evacuee in Gaza—went viral online. Her heritage is Palestinian, Jordanian, and Syrian and she is fluent in Arabic. She has lived in and travelled across the Arab world, and many of her poems are inspired by the experience of crossing borders: cultural, geographic, political, borders between the present and the living past. She translated the screenplay for the award-winning film “When I Saw You”, written and directed by Annemarie Jacir in 2011. She has poems in Floating Bridge Review, Taos International Journal of Poetry and Art, and in the print anthology Being Palestinian, to be published by Oxford Press in 2015. Rajaa A. Gharbi is an international painter, poet and socio-linguist. She was born and raised in Tunisia. A native writer and speaker of the Arabic language, Gharbi is the first North African English language poet in the United States to have been published and awarded public funding for literary work (1986-2006). She is the author of From Songs of a Grasshopper and Digging for Gems (books of poems, Kehna 2004 and 1993) and Blue Forces, a book of essays (Kehna 1998). She is also featured in the Encyclopedia of Arab American Artists, 2007 (Dr. Fayeq Oweis Heinemann 2007),We Have Crossed Many Rivers: New Poetry From Africa (an anthology edited by Dr. Diké Okoro 2012 Northwestern University, Evanston) and the Power and the Role of the Intellectual Symposium, Department of English Language and Literature, Cairo University, Egypt (Dr. Najib Redouane, California State University 2005). She was a 2012 Achievement Award recipient at the international Arab Women Artists Biennale in Sousse, Tunisia, a 2006 Tunisia’s Hannibal Arts and Culture Grant award for an honor performance of her poems and retrospective exhibition in Washington DC. In 2007, she was nominated for the Seattle Mayor’s Art Award and the Horace Mann Achievement Award. Her work is profiled and exhibited around the world. Maged Zaher is the author of THANK YOU FOR THE WINDOW OFFICE (Ugly Duckling Presse, 2012), THE REVOLUTION HAPPENED AND YOU DIDN’T CALL ME (Tinfish Press, 2012), and PORTRAIT OF THE POET AS AN ENGINEER (Pressed Wafer, 2009). His collaborative work with the Australian poet Pam Brown, FAROUT LIBRARY SOFTWARE, was published by Tinfish Press in 2007. His translations of contemporary Egyptian poetry have appeared in Jacket magazine and Banipal. He has performed his work at Subtext, Bumbershoot, the Kootenay School of Writing, St. Marks Project, Evergreen State College, and American University in Cairo, among other places. He is also the winner of the 2013 Genius Award Winner for Literature. 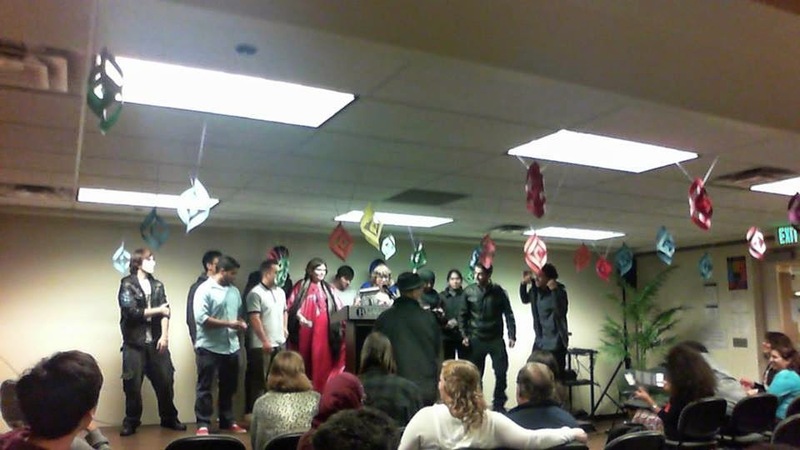 Even the Fall 2014 Arab 101 students got into the evening by reciting “Ahino Ila Chobzi Omi.” I actually was impressed at how well they did. You can tell a large number of them really did memorize the piece. As many times as I’ve heard it, I’m not sure I could do the same! Great job gals and guys!